In the world of oenophiles, there’s one man who garners more passionate debate than any other. No, it isn’t Dom Perignon, the purposed inventor of champagne, nor is it Robert Mondavi, the eclectic developer of the California Wine scene. 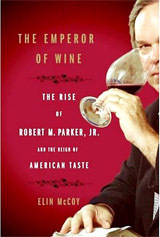 It is none other than Robert M. Parker, the Ralph Nader of wine to his fans or the man responsible for the supposed decline of heterogeneity within the world of wine to his detractors. In The Emperor of Wine, Elin McCoy, a former magazine editor for Parker, analyzes the man and the myth to shed light on his profound impact on the world of wine. McCoy spends considerable time understanding Parker in minute details, painting a very real picture of the man who came from modest roots and with excellent intentions and impeccable values. The second half of the wine book looks at the evidence for how Parker’s 100 point rating scale have had a profound impact on the world of wine with producers becoming instantaneous millionaires or bankrupts with a swirl and a sniff. The outcome of McCoy’s analysis is probably correct; Parker began his career seeking to help the little guy and wound up shaping the wine market in ways he never could have imagined. Has his ego caused him to be needlessly defensive and potentially blind to the outcome of his million-dollar palate? Probably, but that he has come to this fate unintentionally is clear. Overall, this is an excellent wine book for anyone with an interest in knowing more about the most powerful man in the world of wine. Though at times it can be quite detailed, the minutiae form a compelling tale that will help anyone form their own opinion on Robert M. Parker.